Rapid penetrating action with good absorption of calcium by the plant. Liquid formulation is easy to mix and easy to use. Contains no nitrogen, sulphate or chlorides. 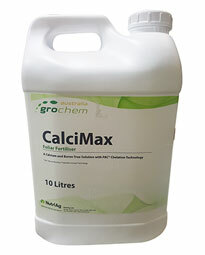 Relatively low dosages of CalciMax have proved to be as effective as higher doses of inorganic salts (e.g. calcium chloride).